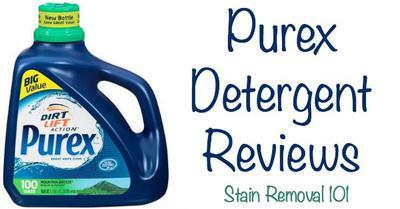 Angela has provided this Purex detergent review, of the Mountain Breeze scent, which works great for her family of five. I have three boys, ages 4 yrs, 3 yrs, and 19 mos. They are hard on their clothes and I like to not stress about them getting the clothes dirty while playing. I use Ultra Purex Mountain Breeze (or whatever scent) I think it smells good. The scent does not stay with the clothes beyond the washer though. When I dry the clothes, they don't have the same smell as air dried clothes. We have had no allergic reactions to this detergent. As far as stains go, we have red clay/mud here in this part of North Carolina and I have found if I put the muddied clothes in a cold water wash within the same day, the stain comes right out. Thanks Angela for your Purex detergent review. Wow, I'm impressed you can get out red clay so easily with Purex, since this can be a very difficult stain to remove. 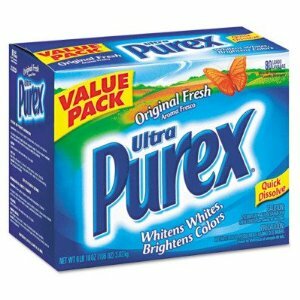 So, does anyone else use Purex? If so, you can share your own review of this brand here, or read other reviews already submitted. In addition, you can share other laundry detergent reviews here, of any brand, telling me what you like (or don't), and why. This detergent cleaned my clothes very well. However, I noticed my eyes were dry and itchy. A week later I developed hives on my face around my eyes. The hives went away and I'm left with dry, stingy, peeling skin where the hives were on my face. It's very uncomfortable. No other detergent has ever done this to me. I went back to Tide Pods which seem to have even more scent/dyes, but they do not bother me at all. I bought this detergent because it was on sale. I got itchy skin, a runny nose, and itchy eyes once I used it. I also started breaking out in a rash. I changed to a baby laundry detergent and now experience no problems. Thanks for sharing this quick review with me. I note that they advertise this as a hypoallergenic detergent but it does not come in unscented varieties, but only with scents. I don't personally consider that to be hypoallergenic, but I guess my definition and theirs is different. I would love to hear from even more people who've used Purex Natural Elements detergents or other products from this line, such as their fabric softeners. You can share your review here. In addition, this is an eco-friendly detergent, and if you're interested in using one I've got a whole list of natural laundry detergent brands currently available, and reviews of them, where applicable that you should check out. I hate Purex. It doesn't work. I suggest that you don't buy it. Sabrina, sorry you don't like this brand of laundry detergent. I would be interested to hear more about why you don't like it, because that could help others make a better determination of whether they would like it or not. If you want to add more detail, I would love to hear from you in the comments. What about any of you? What do you think about Purex laundry soap? Love it or hate it? You can share your thoughts in the comments, or you can write your own review of Purex laundry detergent here. In addition, you can share other laundry detergent reviews here, to tell me which one you think is the best. I have been using Purex for a while. My kids are a little older now so not too many stains to deal with. I like it. Love this! Very low cost! I love Purex. It's only about $3 and lasts me for about 2 months with 4 people living with me. I went through a bunch of different brands before getting this one and I've loved it ever since, plus it works with my front loaders really well. I was using Purex liquid. I would grab whatever scent was available. It was ok but not great on grease stains. My husband grabbed the Kirkland pods and there is no turning back for me. Sorry Purex, Kirkland pods does a much better job. Even better than Tide. My family has always used Purex. My son has skin allergies so I'm careful of what I use on all of the family washables. That includes towels and sheets. When he went away to school he was all excited that he was using something else that smelled good. When the skin allergies came back he made sure to buy Purex for himself. My whole family has a huge allergy to something in Tide. If you are allergic to Tide I highly recommend trying it. Purex Mountain Breeze has worked wonders for me and my family. We no longer have hives or shortness of breath. 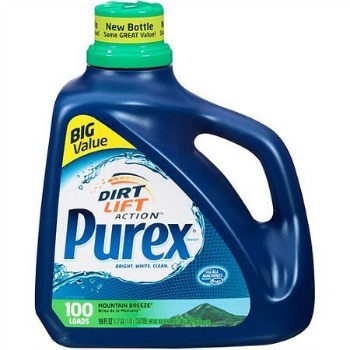 Purex can't be beat with regular laundry and very good price! I only buy Purex, it gets my clothes clean and is reasonable price. Just washed sheets and clothes with Purex Oxi 4 daye ago. Major itching and rash from shoulders to ankles. Sad to say I bought a new mattress thinking it was critters from the mattress. Very expensive situation. I never had this itching issue before. Needs to be a warning on the oxi products. I use Purex green bottle for HE top loading washing machine. Now I'm getting spots on all my clothes from towels, sheets, colored socks & Colored underwear. Looks like bleach spots & not sure if its laundry detergent or machine. Help. There are a lot of possible reasons you're getting spots on your laundry, which makes it difficult sometimes to figure out the problem. Some of them are laundry detergent related, some have to do with the machine, others with the water, and even more possibilities as well. Check out this article about washing machine stains for more information and possible problems and solutions. I have been using Purex for years. It's usually only about $3 to $4 per bottle and it's always on sale plus there's always coupons so I stock up for a very small price. I use to use the scented version until I had my twins. Now we get Purex free and clear and it works great! I love that it's a good detergent for a good price. I had used the basic Purex with no issues and was excited when they came out with the "hypoallergenic" Natural Elements. Both scent offerings smelled amazing BUT after the second day of wearing my neck broke out in a bad rash! I have NEVER had a reaction to any laundry soap, so this took me by surprise. It took about a week to go away after I finally realized it was the detergent causing it and rinsed/re-washed them with a free & clear detergent! About 6 months later I picked up a sheet forgetting it had been washed with the Purex Natural Elements and broke out in hives on my arms after the second night of sleeping with it. Dangerous stuff for people with laundry sensitivities. I used Purex Tahitian breeze scent and my child had a terrible reaction to this product. Please, if you have allergies, don't buy this product. This needs to be off of the shelves in the stores. The worst thing ever to use. I'm having to rewash all of her clothes, towels and bedding. It's a job and a hassle. I had no idea this could happen. 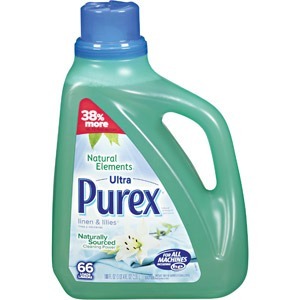 I have used Purex brand before, I just used the wrong kind, so please please don't anyone with allergies use this. washed the bed with this detergent and it stinks very strong smell. Had to strip the bed and wash with Tide. Also worried the mattress may be ruined. Don't know yet, the washer is still on. This is very annoying. I’ve also used Purex Action Lift detergent and also use arm and hammer with oxi clean. (which ever is on sale) My husband works construction. An iron worker to be specific, and he always comes home with metal dust, paint dust welding sparks debris etc.... Using either these detergents and (with oxi clean pre soak when it was a really dirty week) hot water settings and max soil settings. Every last particle was washed away! love love LOVE! Also have a front load h.E (High Efficiency) washer. Heard great results with top load hE washers as well. Hope this was helpful. clothes came out of the wash still dirty and no good scent after they were dry. I'll be switching back to persil when this jug is empty. It was the original dirt lift kind btw. I have been one big itch since using this detergent for the last month or so. Purex leaving non removable spotty marks. I'm getting spots on all my clothes. Purex Ultra Lift Action actually damaged most of my laundry. I couldn't get rid of the spots this Purex made. Bad product!